I admit it, I'm a girl who likes her beauty supplies. And I'm pretty sure it started when I was in 7th grade and subscribed to my first teen magazine (does anyone remember YM?) My friends and I would take our weekly allowance and walk, possibly skip, to the nearest shopping center to explore the colorful and transformative world of drugstore cosmetics. Fast forward a decade or three.... As I get older and become more freaked-out about aging, I'm back to trying out new products. But this time, instead of experimenting with brightly colored lipsticks and eyeshadow, I'm more focused on trying to preserve and maintain. I posted my anti-aging skincare routine earlier this year, but I wanted to share a few more favorites. 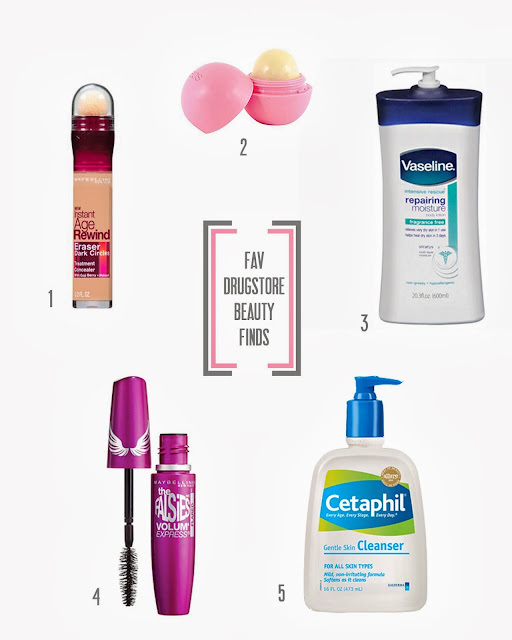 The best part is that all of these items can be found at your local drugstore. 1// Maybelline Instant Age Rewind Eraser Dark Circle Treatment Concealer - The name kind of says it all. I've tried more expensive concealers (YSL touche eclat anyone?) to tackle the dark circles that come along with age and allergies, but I really like this brightening drug store version. It actually feels nice when I apply it and the applicator is easy to use. I haven't had any problems with it accentuating any fine lines (I apply it over moisturizer and mineral sunscreen). That said, this is not a thick, creamy, heavy duty concealer. If you have really dark under eye circles, you're supposed to layer a separate tube of neutralizer shade under the concealer shade. I may have to try out the neutralizer when allergy season kicks in and the dark circles get out of control! For color reference, I'm a medium-beige in Bare Minerals, a medium/tan in Peter Thomas Roth CC cream and the "medium" color concealer works for me. Medium all around. 2// EOS Organic Lip Balm - I tend to lose lip balms, but with it's unique round shape, I can always find my EOS lip balm... even if it's buried in the the depths of my purse. It may look a little strange when you're applying it (like you're kissing a bouncy ball), but I love this stuff. It goes on smooth, keeps my lips moisturized and smells yummy. 3// Vaseline Intensive Rescue, Repairing Moisture Body Lotion - Long drawn out name, but this product is great. It's non-greasy, non-smelly and is good for sensitive, dry skin. It also keeps my KP (keratosis pilaris) at bay. If you have no idea what that is, just be glad that you don't have crazy, sensitive skin like me! 4// Maybelline Volum' Express The Falsies Flared Mascara - My eyelashes are long, but straight as an arrow. With a little curl and mascara, I can go from looking tired to wide awake in an instant. I swear by my Shu Uemura eyelash curler, but this mascara takes it to another level. Just one light coat goes a long way-- it lengthens and holds the curl. I haven't had any problems with flaking, but that may because I only apply one coat. I usually need waterproof mascara to hold the curl, but with this mascara I can get away with the regular washable formula. That said, I still use this make-up remover to remove my eye make-up completely. 5// Cetaphil Cleanser - I mentioned this cleanser before, but I seriously love this stuff. I've been using it for years and like that my skin doesn't feel dry or tight after I wash my face with it. While traveling earlier this summer I used another cleanser and paid for it when I wound up with dry, irritated skin! I started using Cetaphil again as soon as I returned home and my skin returned to it's happy, uneventful self. Not pictured// Dove Go Fresh and Dove Deep Moisture Body Wash - After having children, my skin became extra sensitive to soap. I feel like I've tried every organic and commercial body wash out there and Dove is the only one that doesn't irritate my skin. I'm not sure if its the "Nutrium Moisture", but whatever it is, it keeps my dry, sensitive skin under control and reins in the KP as well. Inspiration // Back to School!